As I sometimes make my way into Panera to allow me to think I have a place to be besides working out of the home, I know I can’t always get my “normal” seat. Often, I (I am a creature of habit with a small, limited ability to be flexible when necessary) can choose another seat and be completely happy with the new seat and view of the Panera parking lot. I function like normal, and accomplish most of what I would normally accomplish. Unless, of course, I am forced to deal with some of the possible negatives that may somehow find me in my “new” seat. Today, I was dealing with a “snorter”. She is sitting right in the table behind me. She has her laptop out as well. She in probably doing it unconsciously, but I sure hear it. If she were one of my kids, I would say, “Please blow your nose.” Since she is a complete stranger, I try to listen to the background music and train my brain to integrate the snort into the music. In all other ways, she seems to be a perfect cube/corner-of-the-restaurant mate. Do I need to mention my wife is not a snorter? My wife clearly does not have the long-snort or short-snort skills of the person behind me. She knows how to use a tissue. In fact, my wife and many others might consider it somewhat rude to snort, snort and then snort some more as they avoid the use of paper products that might remove the urge or need to maintain their “snortiness”. Did I mention she is still sitting behind me as I write this and she arrived just after I did? I believe I just heard her commiserating with another customer with her difficulty in finding napkins. If I were a nicer person, I might delete this whole posting out of guilt. If the snorting would have stopped AFTER her tissue/napkin quest, the guilt may have been heavy enough to prevent the clicking of the eventual “Publish” button. As the snort frequency increases and my brain is becoming more challenged trying to integrate the snorts into the background music/lyrics, I believe my work here is done. In the writing, I have not banished impolite noises from my future. I have, however, been provided an outlet and an opportunity to be double-thankful for my wife. Maybe I will invite her along next time so I can talk over the snorters rather than listen to them! practiced within the most joyous traditions of the religious persuasion of your choice, but with respect for the religious persuasion of others who choose to practice their own religion as well as those who choose not to practice a religion at all. but not without due respect for the calendars of choice of other cultures whose contributions have helped make our society great, without regard to the race, creed, color, age, physical ability, religious faith, choice of computer platform, or sexual preference of the wishees. Disclaimer: This greeting is subject to clarification or withdrawal. It implies no promise by the wisher to actually implement any of the wishes for her/himself or others and no responsibility for any unintended emotional stress these greetings may bring to those not caught up in holiday spirit. Trying to be a good husband last weekend, I committing to moving some plants and planting some new plants in the flower bed. While executing the plan, I neglected to plan for the injuries that so often accompany these landscaping moments. The knuckle on the middle finger was created while using a pick to try and take out a very large root from our now non-existent magnolia tree. While lifting up the pick handle, my finger, although wearing a glove, became wedged between the handle and a barely visible sprinkler head. 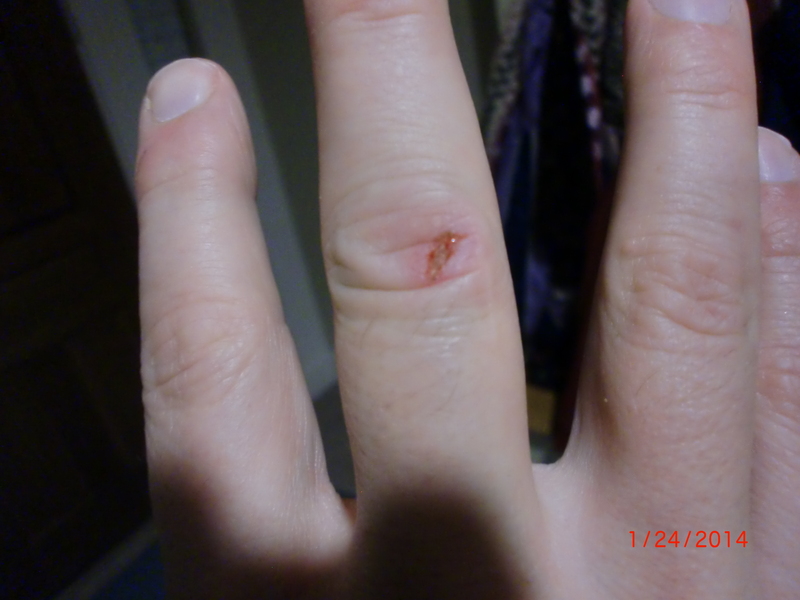 The other injury (on the top knuckle of the pointer finger on the same hand) was caused when I grabbed a tool out of the tool rack. This finger was slit by a sharp edge of one of the other tools. The “how” of the injuries is not really important. It is the challenge of living with injured knuckles until they heal that is the real point. Tucking in clothes: Most people don’t tuck anymore, but I still do. So, it can be a knuckle-bumping opportunity. Hand washing: The washing is not ALL bad. The soap may burn a little. It is the drying that is the worst. The knuckles tend to get a little abuse during the drying process. And, being a little nutty about germs, does cause frequent washings. Flossing: My flossing technique has me wrapping the string around my top knuckles of both pointer fingers. While doing the “flossing” thing, the injury does get irritated. I am a big boy and can handle it. Finger injuries are just not forgotten while they heal. Tying shoes: Again, fingers can be swapped while the knots are being made. Until the knuckles are healed, I am reminded many times during the day that my fingers are VERY valuable. Digging into front pockets: I have to be careful here so I don’t dig into my pocket with the knuckles unprotected. If I dig in with the knuckles “tucked in”, they don’t rub against the inside of the pocket. If I don’t tuck, the scab is scraped off leaving a trickle of blood coming from the re-injured area. Going outside when it is cold and your knuckles dry out: This happened just this morning. Even with gloves on, my knuckles bled. They were so dry a small amount of blood trailed off in the knuckle wrinkles. Buckling seatbelts: It will hurt more depending on which hand the knuckle injury is on. In my case, OWWWWWWW!!!! Do I mean to whine? I am trying to do a sub-par Andy Rooney impression? No, I am just doing a brain dump and capturing a few thoughts. I appreciate you reading. I will try to do better next time!